Airport Tolmachevo - here you can find the schedule of international and domestic flights and get the information about the airport and its services. 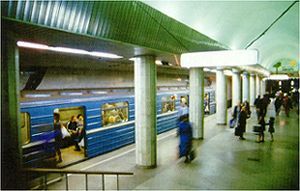 Novosibirsk metro (the only one to the east to the Ural) was put into operation in 1986. It includes 11 stations and a metro bridge across the Ob river 2145 meters long. Novosibirsk metro is the third in Russia in passengers throughput (250 thousand passengers a day). It is safe to say that Novosibirck metro is the cheapest and the easiest way to move to different parts of the city. Unlike stuffy and always overcrowded Moskow underground, it is quite clean and easy to breathe. Even if you don't know the city well you won't get lost since it comprises not very many stations. To take a metro ride you should buy counters and deposit it into a slot of an automatic entry gate and get in . They are usually sold at every Metro station in booking offices in the Metro entrance halls. The fee for one trip by Metro is fixed, i.e. it doesn't depend on the length of your route. Metro ride presently costs 8 Rubles, which is about 27cents. Advice: never go by metro after you have taken alcohol. They have cops on every station who will not simply let you in. Taxi: Taxis can be hailed simply by waving your hand at oncoming traffic. Many "taxis" are, in fact, private citizens who make extra money ferrying people along. Be prepared to pay from 50, to 150, rubles for a trip within the city and from 200 to 300 rubles for a trip between the city and Akademgorodok. You will hardly come across the taxi driver who can speak English, so language barrier will be a problem. When catching taxis try to follow these rules. make arrangements about the ride cost with the driver before you get in and pay only in rubles. Some private companies offer taxi service. All you need is to dial their number and make your order. They provide fast, convenient transit from door to door. Call any hour any day to have one of their Taxi dispatched to your location.